I have been messing with Helen's new bike today. 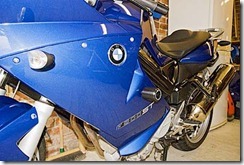 I had the dangerous task of drilling holes into the fairing to fit a set of R&G crash bobbins to the BMW. Can you imagine how much trouble I would have been in if I had put the hole in the wrong place. Thankfully my usual time consuming carefulness made sure that the holes were in the right places. 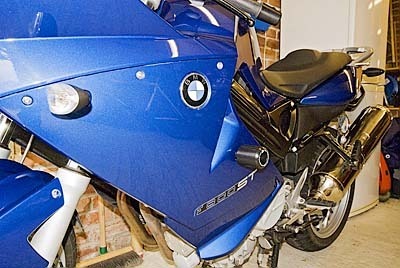 After fitting the crash bobbins I then installed Invisible Film to both sides of the tank to protect it from Helen's knees scratching the tank when cornering.